CRO Mia Negru is an MSc in International Business and Politics from 2016 and co-founder along with her sister of 2030 Builders, a start-up helping companies make money, save money and create impact while realizing the United Nations’ 17 sustainable development goals by 2030. 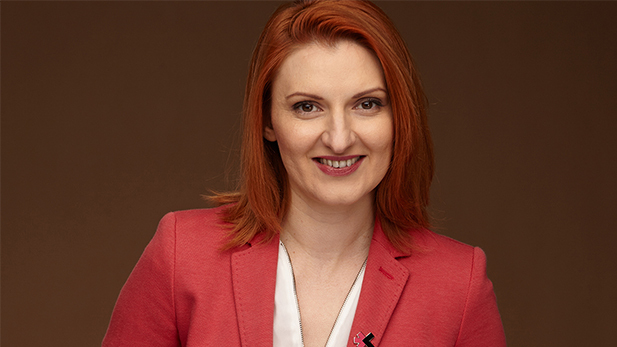 The 35-year-old Romanian came to Denmark after failing with a company in Romania during the financial crisis and decided to add a business degree to her two Romanian bachelor degrees – one in Law and one in International Relations and European Studies – and her postgraduate diploma in International Law in order to get building a business right. When I was accepted into the IBP master programme (International Business and Politics), I felt both extremely happy and challenged to realize that I had to use all my capabilities to keep up with the young, bright, competitive, top-performing colleagues that I was going to have. I soon understood that CBS was not about competing against each other, but using our diversity of background and experience to learn and grow together. My background as a Romanian female who grew up in the forest, as an entrepreneur going back to school and an immigrant navigating a new culture definitely brought in a new perspective for my classmates. They always enjoyed hearing my stories from the communist times and from living in the forest: hiding coffee beans in a cipher locker and doing homework by gas-lamp light. I was curious and excited to discover a teaching system very different to what I knew from Romania. The collaborative problem-solving approach was nothing like the learning books and manuals by heart style from my Law bachelor. I was empowered by the real-life cases we had to solve, by the leadership stories from Danish companies and organisations and by the teachers’ openness and guidance. So very quickly, I realized that I could contribute more and gain more from CBS, so I joined the IBP Union Board and opened for new learning experiences and new friendships. As the majority of CBS graduates, I started applying for graduate jobs and getting quite a few rejections after receiving my diploma. Even before applying, I somehow felt that because I was no longer in my 20ies it might be unfair to take the spot of a young and inexperienced student who needed their first work-life experience. By that time, I had quite a big network, because my first priority when moving to Denmark was to build one up and integrate into society by surrounding myself with driven people who would help me grow. Thus, I had joined professional networks like JCI (Junior Chamber International), skills development networks like Toastmasters and generally been quite active and involved in the local entrepreneurial ecosystem. Many friends told me that the easiest way to get a job in Denmark was through your network, as people who know you beyond your CV and cover letter can assess your personality and fit for a specific job better. However, I was too proud to ask for help. Still, my first job did come through my network when a dear JCI friend spotted that my long experience in entrepreneurship and my talent of spotting partnership opportunities could be something that I could use as a Business Consultant at Business House Copenhagen (Københavns Erhvervshus). For me, it was the dream job to work with entrepreneurs, establish strategic partnerships for the Business Mentor Program and deliver courses on how to start a business in Denmark for foreigners. Which moments in your career have been defining – and how? With my IBP education, it made sense for me to work for the Copenhagen Municipality, as the education prepared us for the public administration sector. At the same time, I felt that the best of my knowledge accumulated during my studies was rusting from disuse. Advising entrepreneurs on their business challenges and hearing their inspiring stories always took me back in time to when I had my own business and the feeling of amazing satisfaction from building something from scratch and seeing it grow. Defining for my career was when my sister moved back to Copenhagen after living for two years in New York, and she came up with the idea to develop a game on Sustainable Development Goals. This idea was defining, because it gradually transformed into the start-up company that we are working together in. Our game idea grew into an SDG Strategy Tool, and our mission is to help all companies become sustainable and work towards achieving UN’s SDG Agenda 2030. For the last five months, I have been working 10-12 hours a day, putting four-five hours every day into building the start-up. I stopped at Business House from the end of May 2018 and went full time into 2030 Builders, developing a product that we want to export globally as a Danish solution for sustainability with UN’s SDGs as a starting point. It was at CBS that I discovered how to have a business approach towards sustainability, and this is what I am working with today. It was in my last year of study that the UN adopted the Agenda 2030, and the Sustainable Development Goals became the new sustainability framework – the framework at the core of what I am developing today at 2030 builders. I am grateful for an education that gave me both the Danish mind set in problem solving but also the right business and sustainability tools to implement in growing my own business. Have you maintained a relation to CBS since you graduated? I have maintained relations with CBS during my time at Business House, as the CBS Alumni network seemed the obvious partner for getting business mentors for our start-ups, and I have received a great support in this matter. At the same time, CBS is currently hosting our office through the Copenhagen School of Entrepreneurship and gives us access to an amazing talent pool of young students willing to contribute to our mission to help companies develop a strategy for incorporating Sustainable Development Goals. Lastly, attending different events organized by CBS gives me access to knowledge and furthers my networking opportunities on an ongoing basis.